There’s an old adage, ‘everything old is new again’, the reverse of which is ‘everything new is old before long’, and the depiction of the future on screen constantly moves between these two states. In UK cinemas over the past few weeks, lucky audiences could have seen a preview (at FrightFest) of the new Chinese horror film Dream Home (Wai dor lei ah yut ho) – which one could easily sum up as ‘Cantonese Psycho‘ as it continues some of the themes, in particular psychotic reactions to consumerism, that define Brett Easton Ellis’s seminal work – and a restored version of Fritz Lang’s Metropolis (1927) in the longest cut to have been made available for over 80 years. Metropolis (reconstructed and restored) was out in UK cinemas on Sept 10 and will be released on DVD and Blu-ray by Eureka Entertainment on November 22. Dream Home will be released in UK cinemas on November 12 by Network Releasing. Dream Home is not science fiction because it is set in the recent past and ‘based upon a true story’, but if it had been made 10 or 20 years ago and set in 2008, it would have been classified as SF. This may seem like a ridiculous thing to say as every film set in the present would have been seen as sci-fi by viewers if they had seen it a decade early, but Dream Home continues SF themes of overcrowding and ‘future-shock’ postulated by JG Ballard, Harry Harrison and the writers of various Judge Dredd strips in the British comic 2000AD. What’s more, by being set in an ultra-modern Asian city, it follows in the footsteps of SF films like Alphaville (1965), World on a Wire (Welt am Draht, 1973) and Code 46 (2003), where the filmmakers used footage of new, unfamiliar architectural developments to create an appearance of the future. On the other hand, Metropolis is both a vision of the future and a historical artefact. Created in 1927, it was the most expensive film ever made at the time, costing 5 million Reichsmark (ironically the same amount in Hong Kong dollars that the dream home, a desirable waterfront flat, of the above film is priced at) and even today, the astonishing sets, huge cast and beautiful model work show a budget well spent. Needless to say, the film’s vision of the future hasn’t yet become reality; latticed roads in the sky, an underclass of subterranean workers and zeppelins have become sci-fi clichés since its creation, shorthand for the future as much as jet packs and laser guns. However, like all beguiling visions of times to come, Metropolis extrapolated elements of its present to predict what might come to pass. The Wieliczka salt mine in Poland, begun in the 11th century, contains vast chambers and even a chapel, grander than the one shown in Metropolis, while the Merkers salt mine became notorious in the 1940s when it was discovered to contain Nazi plunder, and Getty images from the time show vast industrialised caverns that would allow movement of hundreds of workers. Although Metropolis shows the exploitation of the workers by the ruling class (shown as fit Aryan specimens) it also concludes that they need to work together, and the anti-capitalist message of the film co-exists with scenes of exalted crowds equally ready to blindly follow a saintly leader and her destructive double, which anticipate Nazi Germany. The ambiguous story was developed by director Fritz Lang and his wife Thea von Harbou, who wrote the screenplay, and they separated in 1931 after she joined the Nazi party. The ‘new’ footage added to the current print of the film varies between pristine 35mm and extremely grainy 16mm and the later reinforces the perception that this is a historical document – a preservation of the future imagined at the beginning of the 20th century. 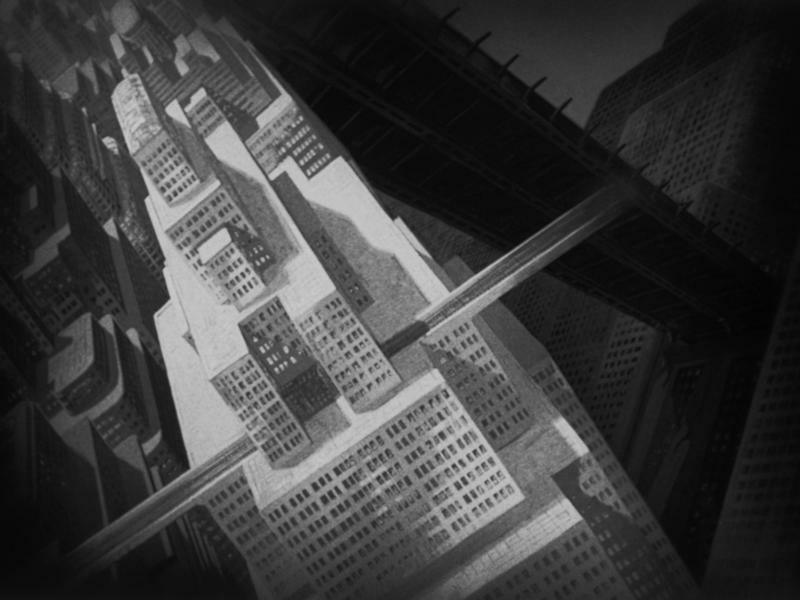 The success of Metropolis led to a brief flurry of imitators – the British High Treason (1929) and the American Just Imagine (1930) – which featured similar model work for their crowded urban landscapes, with scores of flying machines weaving between the buildings, video phones and teeming masses lining the streets below. Both these English-language knock-offs foolishly named a date for their visions of the future – High Treason was somewhat ambitiously set in 1950 and concerns a peace movement bizarrely using terrorism to achieve its aims, while Just Imagine is located in 1980s New York, and in terms of the number of skyscrapers per square mile got closer to the future, now past, that it predicted. The British are the unsung heroes of futuristic landscapes. Before we skip ahead to the British-directed Blade Runner (1982), High Treason was followed by Things to Come (1936), which delineates the future history of London over the next century, while The Time Machine (1960) shows the destruction, recreation and destruction again of London over the next 80,000 years. Both films oscillate between utopia and dystopia, as is the case of much science fiction, and relay social historian HG Wells’s concerns about the future of mankind being inextricably linked with endless war. All of these early British SF epics continue the tradition of fantastical set building instead of basing their vision on reality and so have become quaint in their depictions of the future. Social realism in the cinema brought with it social realism in science fiction. As I mentioned at the start, Jean-Luc Godard’s Alphaville and Rainer Werner Fassbinder’s World on a Wire based their visions of the future on the present, a convincing approach since unless the world gets temporarily destroyed by an apocalypse (as suggested by Wells) before being rebuilt, elements of present architecture will persevere into the future. Godard and Fassbinder chose unfamiliar locations to create their futures and even though these have now also become historical documents, there is a certain frisson in seeing these locations as they represented the shock of the new at the time and were perceived to be as dehumanising as any futuristic construction. It’s very telling that George Romero would set his second zombie movie – Dawn of the Dead (1978) – in an abandoned shopping mall, also the set (albeit on a different continent) of some of the scenes of World on a Wire. All of these films see their protagonists separated from the mindless ‘other’ – virtual reality drones, computer brainwashed, living dead – by endless panes of glass and walls of concrete, the most iconically modern of building materials. Godard also set a precedent for the private detective – a character who always seems more at home in the alienating city than the desolate landscape beyond – as the ideal protagonist for speculative fiction scenarios. Godard poached his from an existing series: Eddie Constantine had been playing Lemmy Caution on screen since 1953 in such lurid dramas as Poison Ivy (1953) and Diamond Machine (1955) and would continue to do so until a couple of years before his death in 1993, one last time for Godard in Germany Year 90 Nine Zero (1991). Although not specifically described as private detectives, the protagonist of World on a Wire and the titular Blade Runner are also investigating city-based murders while the empathic insurance investigator of Code 46 is investigating fraud in a company that allows people to travel freely between cities surrounded by hostile environments. Blade Runner was partially set-bound, a quality that allowed director Ridley Scott to needlessly shoot new scenes for his ‘final cut’ in 1997, but also used some very recognisable places such as the Bradbury Building, a famous LA noir location used in Double Indemnity (1944) and D.O.A. (1950) as well as a 1972 horror TV movie The Night Strangler. Like Metropolis, The Time Machine and various Judge Dredd strips, The Night Strangler suggested humans or sub-human creatures might live in an underground metropolis as one city gets built over the ruins of another. These are cities that are constantly retrofitted, abandoned and restored as if these old skyscrapers and brownstones might become the reclaimed caves of the future, barely habitable but still capable of supporting some semblance of life. The ruinations of these now century-old cities are taken to their logical conclusion in films like Planet of the Apes (1968) its sequel, Beneath the Planet of the Apes (1970) – another home of underground sub-humans – and A.I. (2001), where New York is submerged beneath land and ice respectively. Godard’s location of choice doesn’t escape this fate either, shown submerged beneath 60 feet of sand in the charming time travel comedy Peut-Ãªtre (1999), and when the desert hasn’t claimed the city itself, it has laid the suburbs to waste in Mad Max beyond Thunderdome (1985), Judge Dredd (1995) and Code 46. Unlike previous examples of silicon attrition on film, Code 46 doesn’t rely on outré sets to convey the futuristic and strange but rather creates a city that is both current and forward-looking by combining shots from a variety of global cities, folded into the structure of Shanghai, a city that like Hong Kong in Dream Home already has a retro-futuristic look to it. Needless to say, it comes as no surprise that many commentators compare Blade Runner‘s LA of 2019 to the Tokyo of the present day. The city of the future reflects the aesthetics, concerns and zeitgeist of the present. It is informed by what looks futuristic to us now and what can be retrofitted to look impervious to (or victim of) the ravages of time. Films made in the 1970s but set in the 22nd century still look like the 1970s due to the clothes that the characters wear, but who’s to say that people in the future won’t wear the fashions of the future as predicted by people of the past, as kids watch the likes of Star Trek (1966-69) and Logan’s Run (1976) and think silver mini-skirts are cool? Cinematic cities have a prophetic nature not only through the work of the people involved in the movies themselves – Blade Runner owes a debt to the original Metropolis through special effects supervisor David Dryer’s model work – but also the greater aesthetic environment of the times they are made. Code 46‘s architectural mash-up may be partially down to finance and expediency but ‘futuristic’ cities being built now in the United Arab Emirates show architectural influence from around the world and even a touch of sci-fi fantasy to boot. The sci-fi city is therefore a city of the now, a city of the then and a city of what always will be, but those of us who are going to spend our lives living in the city of the future will just have to make sure there’s a decent stock of kinetically charged torches in the cupboard for when the lights go out.